I love a good cheese ball. Seriously. And as easy as they are to make, it’s kinda hard to find one that tastes really good. Right? I’ve bought tons from the store over the years and never really found one to get excited about. I’ve also made a few from a number of recipes and they were okay. But it wasn’t until I really started experimenting that I hit upon ‘THE ONE’ that I love. 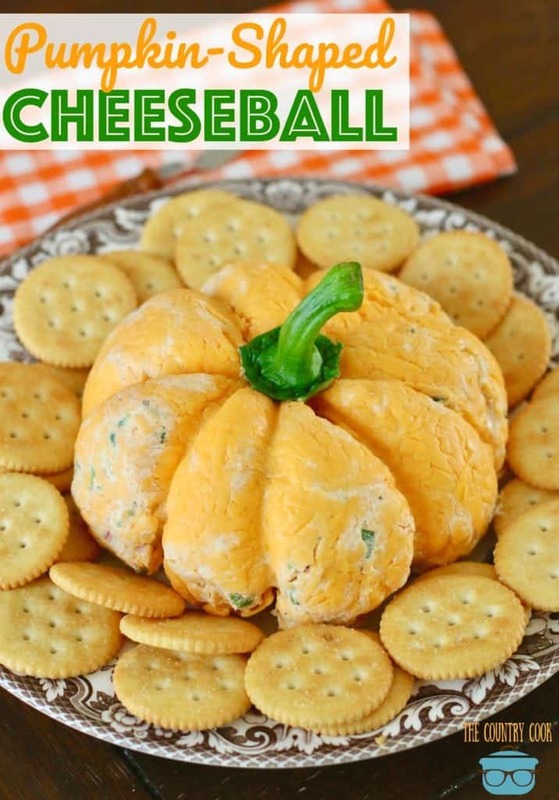 I use this same recipe for my Pumpkin-Shaped Cheese Ball but I wanted to show you just how versatile it is. 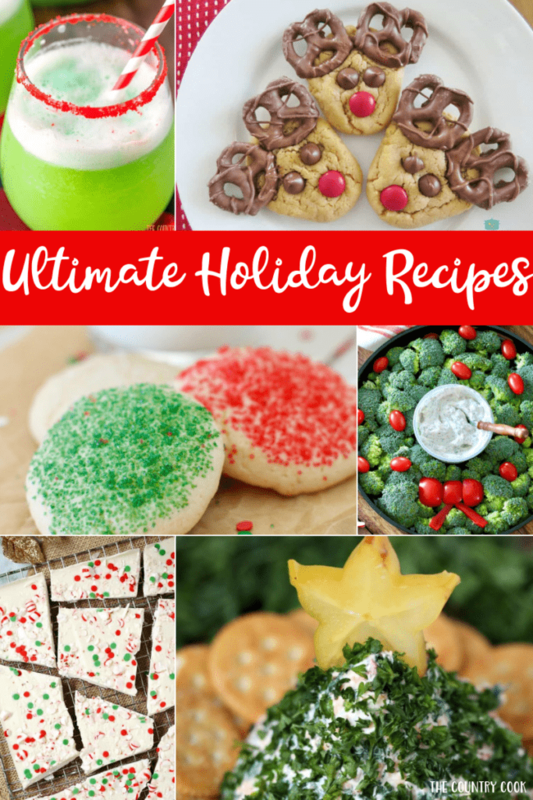 It’s not only pretty and easy to make but it actually tastes amazing! Don’t get me wrong, it’s nice when food looks cute but none of that matters unless it tastes good. You know what I mean? Kinda like wedding cakes. Some can look gorgeous – then you dig into them and they are dry and stale. What’s the point? I waited all day for some cake, darn it! 😉 This recipe will not disappoint! Use it for any occasion. Merry Christmas friends! 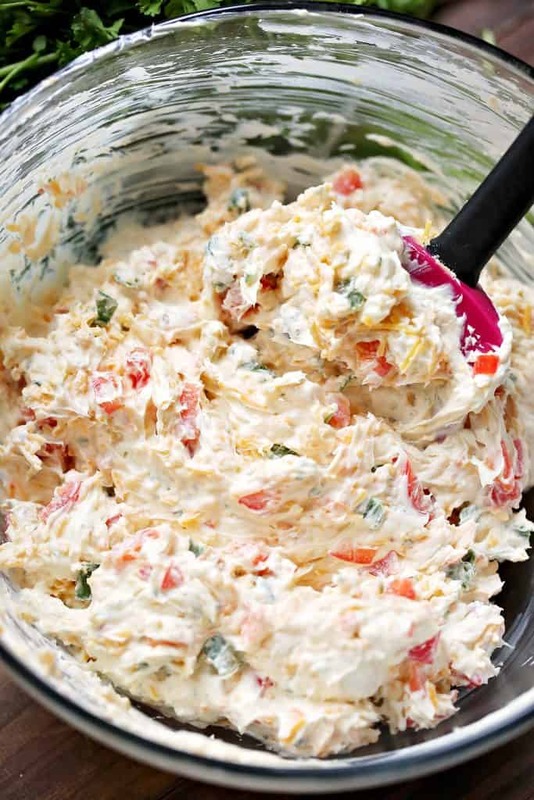 Stir in 2 tablespoons of ranch dressing mix, green onion, red pepper and shredded cheddar cheese. Spread out a large sheet of plastic wrap. 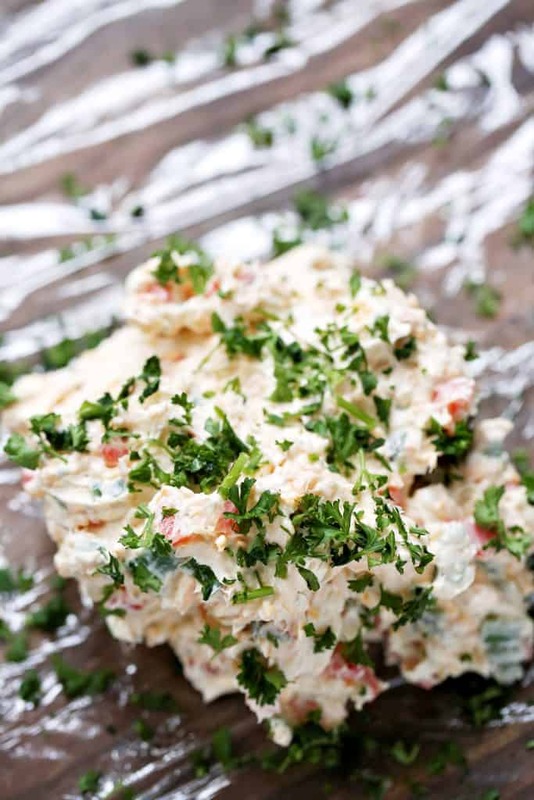 Sprinkle half the chopped parsley onto the plastic wrap. 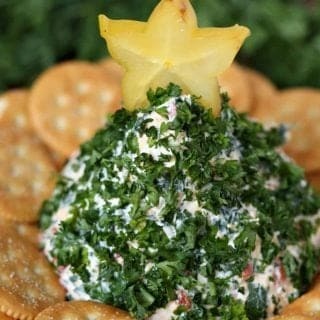 Take the rest of the chopped parsley and sprinkle it onto the tops and sides of the cheese ball and wrap it up well with cling wrap. Gently form the cheese ball into a cone (tree) shape. If the mixture is too soft, pop it into the refrigerator for about an hour, then try again. 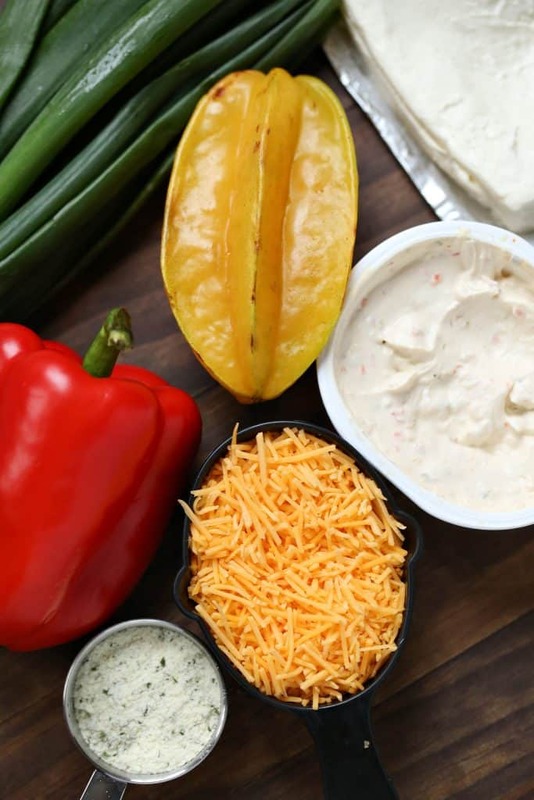 Once formed, place the cheese ball into the fridge for a minimum of two hours (overnight is best.) Not only do the flavors get better as it sits, but as the mixture cools, it will help it to keep the tree shape. When ready to serve, carefully remove the cling wrap. Then add on a slice of star fruit to the top. And dot the tree with pomegranate seeds (gently pushing them into the cheese ball.) 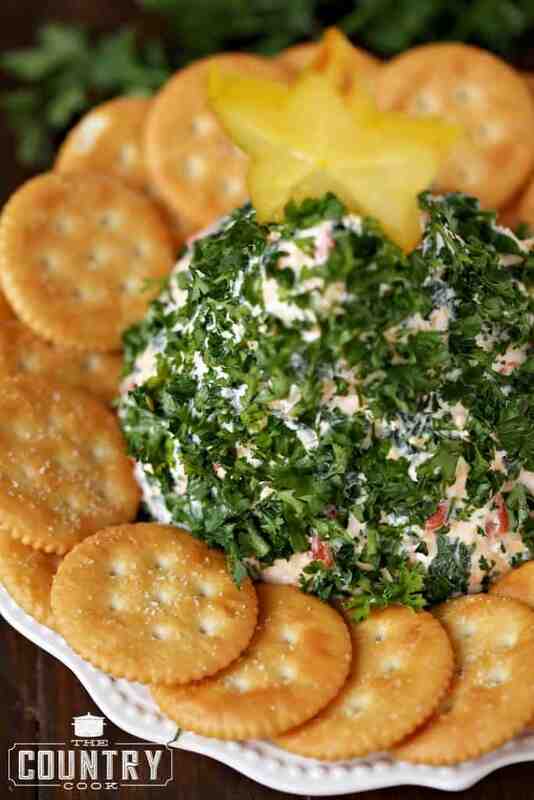 Serve with your favorite buttery crackers. 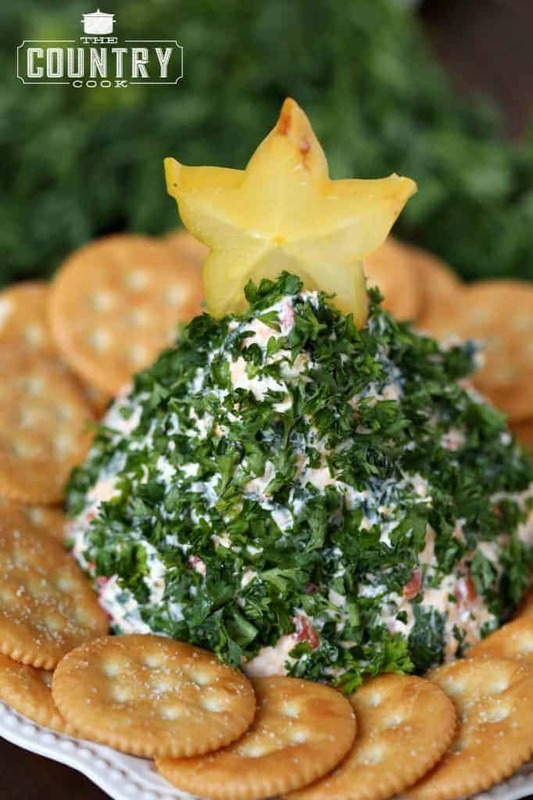 This Christmas Tree-Shaped Cheese Ball is the hit of every holiday party. It looks pretty, it's simple to make and it tastes amazing too! Spread out a large sheet of plastic wrap. 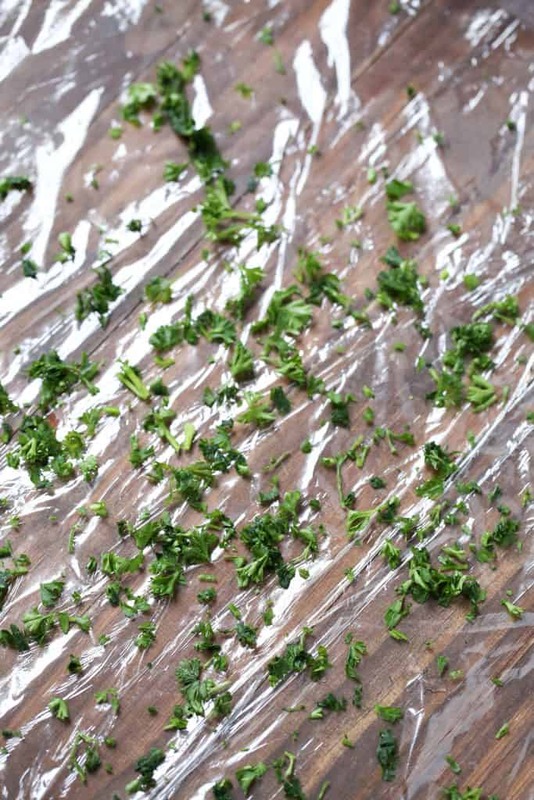 Sprinkle half the chopped parsley onto the plastic wrap. 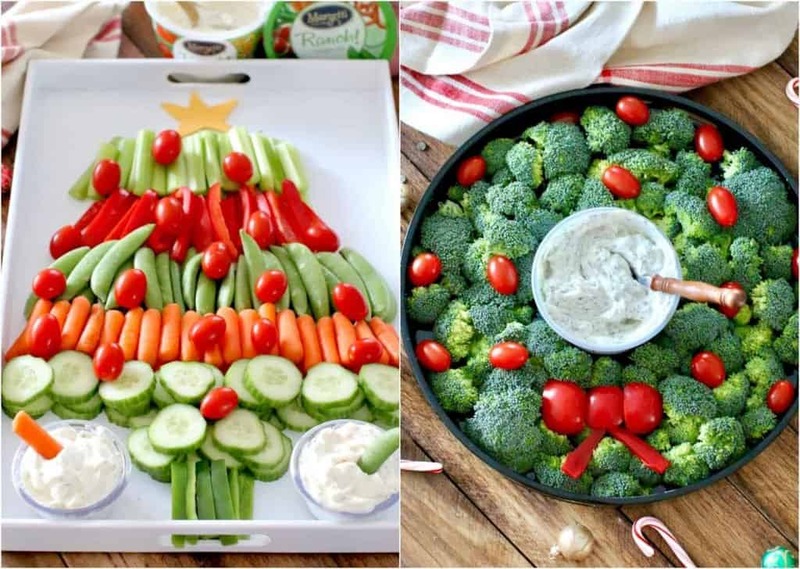 Gently form the cheese ball into a cone (tree) shape. 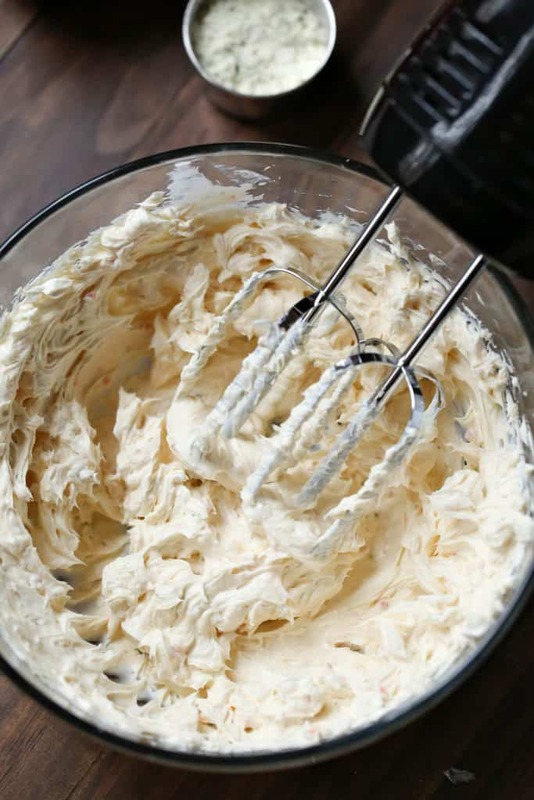 If the mixture is too soft, pop it into the refrigerator for about an hour, then try again. 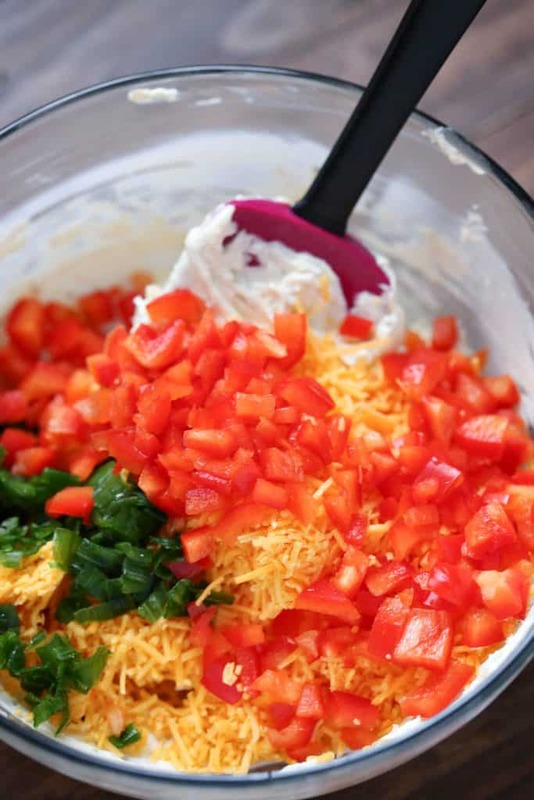 Once formed, place the cheese ball into the fridge for a minimum of two hours (overnight is best.) Not only do the flavors get better as it sits, but as the mixture cools, it will help it to keep the tree shape. When ready to serve, carefully remove the cling wrap. 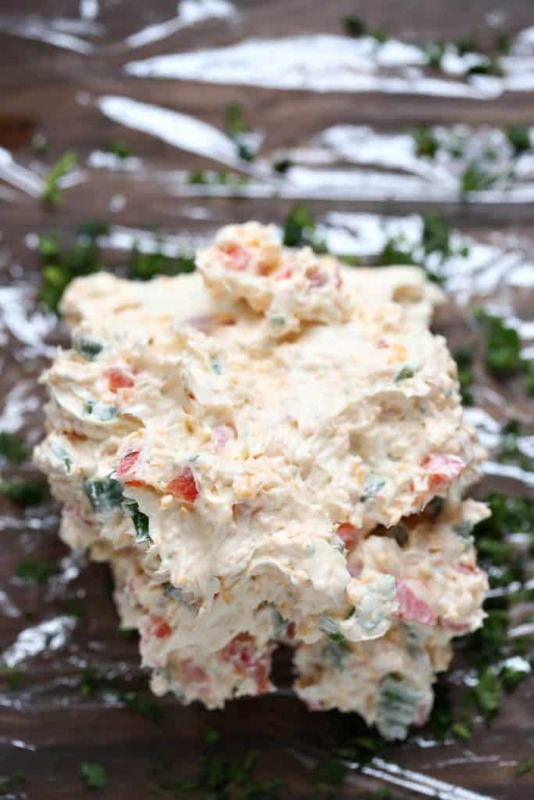 Thanks for such a neat cheese ball…..I made 3 of them for parties next week and need 3 more! What a great hostess gift! I made this for our Halloween Potluck at work. Everyone loved it! I had to share the recipe. THE BEST MOST AMAZING CHEESE BALL ON THE PLANET!! I made this for a family get together on the 23rd…we are still talking about this lump of deliciousness. I was too lazy to shape it into the Christmas tree shape, so “sadly” mine was just a ball…oh what a ball it was!! 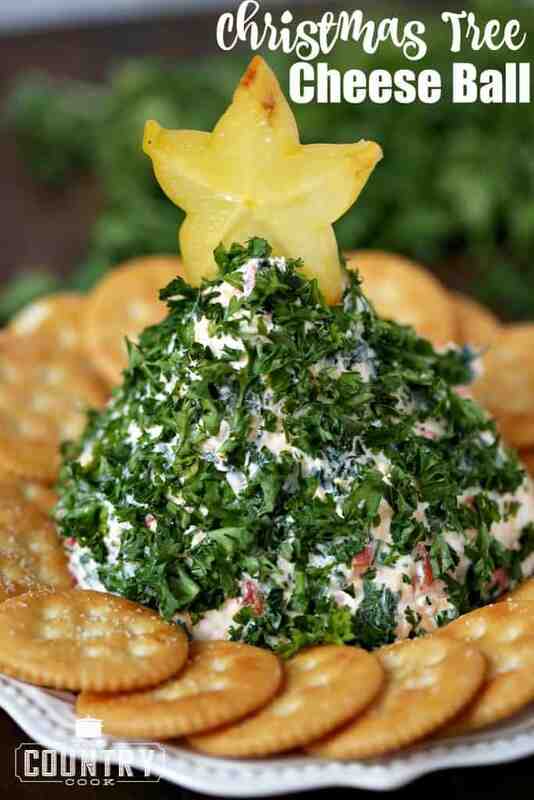 Thank you so much for sharing this incredible recipe and making me a rockstar with the in-laws!